The latest list of approved SSD's is in our URSA Mini and URSA Broadcast manuals in the Camera 5.1 update. The Samsung 860 EVO 2TB, 4TB and 860 EVO PRO 2TB & 4TB have been added. These SSD's tested well. Worth noting that on both of the EVO PRO's we would not recommend lower bitrate recording such as 1080p60 ProRes HQ for long duration recordings of over 20 hours. This is also listed in the 5.1 URSA Mini and URSA Broadcast manuals. Hello All! I'm in a serious jam. I've shot some footage using my Blackmagic Production 4k camera. I shot the footage onto 2 Samsung 850 EVO card 500GB. I've used them plenty in the past but now both ssd's are not showing up on my Mac at all when mounted. I used a friends Window PC to see if it is a formatting issue and it's giving me an error saying it "cannot start". I can watch all of the footage in camera. I hope someone can help me since I am on a tight timeline for a client. THANK YOU! If the Samsung EVO and PRO from the 860 series are tested good, surely the 1tb version meets all requirements as well? I can’t find anything lower in the specs compared to the 2 and 4tb versions. Any thoughts why it might not work? Ron Exalto wrote: If the Samsung EVO and PRO from the 860 series are tested good, surely the 1tb version meets all requirements as well? I can’t find anything lower in the specs compared to the 2 and 4tb versions. Any thoughts why it might not work? Quite curious about this as well. As I personally find 1tb to be the perfect storage size to get. Has anyone tried this setup yet? It requires no external power and most of all you can get a 1tb mSata ssd for like under $300! TeryWilson wrote: Has anyone tried this setup yet? It requires no external power and most of all you can get a 1tb mSata ssd for like under $300! Will the SanDisk 1TB Extreme Portable USB 3.1 Type-C External SSD work with the Pocket Cinema Camera 4k? I wanna know too for the Pocket 4K with the sale going on. Think 250 is worth it? Chris Chiasson wrote: I wanna know too for the Pocket 4K with the sale going on. Think 250 is worth it? Pricewise it is the lowest cost storage for raw video. But will it have any compatibility issues? All the BMD pictures show the Samsung. The SanDisk is a little lighter and has that loop that I think could go around a camera strap. 8Sinn has of a cage for the Samsung T5, though it isn't yet available for sale on their website. I think the 500GB Samsung T5 at $99 is the lowest SSD you can get right now.. could be wrong.. but having a couple of those around assuming BRAW is on the BMPC4K will result in I think a couple hours of 4K 12-bit RAW at 60fps? Probably depends on 12:1.. not sure what Q0 will require in storage yet. That you can use a SATA-3 to USB-C adaptor to plug in any SSD is very nice too. DavidNJ wrote: Will the SanDisk 1TB Extreme Portable USB 3.1 Type-C External SSD work with the Pocket Cinema Camera 4k? Yeah, I'd love to have a list of supported external SSDs on the new Pocket, too. Too bad that SSD sale is already over. You can find good prices on lots of SSDs. I still think the Crucial MX-500 series is one of the best deals going. 500GB for $89, 1TB for $169. I cant imagine given it has some of the latest tech in it that it couldnt handle the BM4K output at 4K60 in raw. I find it odd that some SSDs that claim 500MB/s write could not handle the speeds needed for 4K60 raw. 544MB/s datarate according to the BPCC4K charts (30fps x2). For single SATA6G SSD that will be hard to achieve specially with USB 3.1 gen 2 (10Gbps)->SATA6G controller in the mix, with unnatural queue depth in "test" programs perhaps, but in basic file copy there is 20% penalty in writes (475 -> 375) at least with ASMedia ASM1351 controller with Samsung EVO 860 2TB. Samsung T5/SanDisk Extreme have ASMedia ASM235CM controller and they seem to have somewhat similar limitation in write speed according to some online reviews. Then there is the third ASMEdia ASM1352R controller that offers a basic raid options, that should achieve the needed data rate in raid 0 configuration (will report once I get the BPCC4K), but it requires external power (12v 2A). However I vaguely remember reading months ago in these forums that the BPCC4K has USB 3 gen 1 (5Gbps) USB-C port, that would mean that my single drive enclosure USB -> SATA6G SSD is throttled in that port. In a perfect world, 5Gbps will cope with the 4K60p data rates; but as we know, it’s not a perfect world out there. I can understand the urgency to know the limits of the camera. BMD has said they’ll post the approved media for the BMPCC4K shortly. I imagine they will complete their tests this week. I just wish we had some comformation by now. So far the T5 is the only drive getting rigs made for it, yet we don’t know if it can handle the highest settings. Chris, I’ve sent a note to Wise-Advanced to see when their new Wise Portable SSD USB 3.1 Gen 2 drive will be released (due to be released in October). Their drive is optimized for 4K raw up to 60 fps. The maximum capacity is 1TB. But I don’t know the specific details. For example i don’t know if they mean raw uncompressed or raw 3:1. I would think it’s raw 3:1 as the rated speed is up to 520MB/s. They may have reached those speeds pushing the data from a Gen 2 port as well. But they do specifically advertise its suitability for the BMPCC4K! That’s why I’m waiting and not biting on the amazingly inexpensive sales currently running for the Samsung T5. I’m also intrigued by what they’ve done to “optimize” for the BMPCC4K. That might have something to do with tuning their on-board data controller to sync with the way BMD communicates with devices to write records. I hope that’s true. Personally I can wait as I have two Wise CFast 2 3400x cards and a Wise SDXC UHS II Card. And I won’t be shooting 60p for clients this year AFAIK. Although we don’t know the timeframe for BRAW on the BMPCC4K, that’s a game changer as I expect BRAW 3:1 4K60p (and possibly Q0) will not be an issue. Your grandmother will be able to record 60p BRAW 12:1 and Q5 while she’s knitting your Christmas stockings! Ya, just saw the Wise solution. I like this one a tad because it doesn’t require a Cage, and just uses hot shoes. Thanks for posting the pic of the Wise Portable SSD Mount. Looks pretty secure and minimal weight for the device and the holder. The whole idea is they’re trying to obviate the need for having a cage. I talked to Wise and the new Portable SSD should be available in North America mid-October so that works for me. Sorry, can anyone update this list? I cant imagine in 2018 that BM would put a USB 3.1 Gen port on the camera.. knowing full well they want it to handle 4K60 RAW.. but BRAW was in the works for years, so perhaps they already knew it would get BRAW soon and Gen 1 port was cheaper/easier to put in.. and should support I would assume 4K60 Q0 right? I still havent found the data rate info on Q0 and how much a 500GB SSD will hold of it. Ya, I kinda wish they went with usb 3.2. The speed would match Thunderbolt 2. But I guess they didn’t because nothing uses 3.2 yet. I had issues today with the Samsung SSD 850 EVO 500GB. It stopped recording after showing (!) on the record button. I thought maybe overheating, since i thought this SSD is on the support-list. But there are only the 1TB and the 4TB. Does it really make much of a difference? I am confused. Johannes, apparently “size matters” when it comes to SSDs. I found this is true when the internal storage uses flash memory. When I bought my iMac 2017, I was able to see the performance of others’ iMacs that had 256GB or 512GB as I recall. Each increase in size provided better performance. It would also appear to be true of SSDs if your 500GB drive is not on the BMD list, but larger devices from that manufacturer are. I successfully filled the Sandisk Extreme Portable SSD 1TB at 4K DCI 60p 3:1 Raw (approx 55mins) on a fast moving scene, no issues or dropped frames. They don't list this drive on the recommended media for 3:1 Raw though so YMMV. Lossless 4k60 only manages about 10 seconds, but that's no surprise. Samsung T5 500GB works well, but won't do 4K Raw Lossless 60p. 4:1 is as far as I could get, which is annoying. I also had an issue where the camera just turned off when switching from ProRes to Raw, with this drive plugged in. When I restarted it the camera couldn't see the drive at all. I needed to re-format on my laptop to get it working again. This happened twice unfortunately. Conclusion: I'd buy two of these in case this happens to you on set. Or at least have a beefy SD card as backup. I also tested a Samsung Pro 970 512GB NVMe SSD drive, in an enclosure. The camera is USB-C 3.1 Gen1, and this enclosure is Gen 2. I'd assume it would work, but the camera won't recognize it at all, no matter which way it's formatted (OS X Journaled, ExFAT, FAT, APFS). I'm going to keep testing this because the 970 is blazingly fast on the BM speed test, using my MacBook Pro 15" 2018. About twice as fast as the T5. I'd hoped that I could take footage out of this enclosure, and into a Thunderbolt 3 enclosure, for insanely fast backups. Conclusion: I'd hold off investing in NVMe SSDs until somebody figures out how to get it working. My enclosure powers up via USB-C just fine, but perhaps that's not enough. It definitely isn't the cable, hopefully isn't the drive entirely, and is probably the fault of the enclosure or BM. Finally I couldn't get the 1TB G-DRIVE R-Series USB 3.1, Glyph 1TB Atom USB 3.1, nor the Glyph Atom RAID 4TB USB 3.1. I understand the latter, but those first two should surely work. Part of me wonder's if BM is deliberately preventing the camera from showing a drive it doesn't specifically recognize – which I find hard to believe given BM's general philosophy. What's interesting is that I can get an SD card or the T5 to work through a USB-C hub, a regular HooToo. For the 4k Raw lossless 60p, no drive can do that. I suppose neither a NVME. It is a limit of USB C Gen1 (considering also the overhead). I saw no one SSD Gen1 test above 500MB/s, whilst 4k 60p is way above that. I saw a video on YT (jsfilmz) that explain another way to solve the SSD not recognized: disconnecting, reboot and then reconnect: have you tried this? Weird for the NVME test! Which enclosure did you test? I hope BM could solve this problem, as even me want to use those SSD (not only for this camera). More, I think they are the ideal solution for this cam (better if they used a Gen2 connection, but this is another problem...): they are a lot better after the recording, cause they can read the footage at double speed to copy them faster to pc or backup! You're absolutely right – I've not been able to get the NVMe above 500MB/s via USB-C. I wouldn't expect it to perform any better when recording, just offloading. Also I got mixed up and re-tested it, it is 3:1 not 4:1 sorry. - Different cables, that have proven to work with the T5. - Powering the BMPCC4K via DC. - Formatting the SSD any way I can. - Plugging in the T5 and then switching out the NVMe without turning off the camera. - Plugging in and out the SD card while the NVMe is connected. - Switching recording modes and resolutions. The enclosure I'm testing seems to be a rather popular one, although I'm not sure I can post a link to it here (I'm a new user). You can find it on Amazon named "ADWITS USB 3.1 UASP to PCIe NVMe M.2 2230/2242/2260/2280 High-Performance SSD Adapater". I'm talking to a few PC repair shops in my city and will be visiting them to test various enclosures. If I can nail this down it'll be worth it I think. Sure, we must find a way to make NVME SSD work with pocket 4k! But, the speed I was referring above of 500MB/s is related to the USB-C Gen1 port, even using a NVME SSD: you can't go over it. Instead, if you connect a SSD NVME with enclosure USB-C Gen2 to a USB-C Gen2 port on a pc/mac, it COULD go lot faster, reaching quite above 900MB/s! The problem is, some pc chipset that is *declared* USB-C Gen2, in reality cannot reach that speed and it lowers to quite a Gen1 one or similar... weird. At that time (2016), you can find 3.1 at 593MB/s, the best was 770MB/s in write, now (2018) you can see it can reach 913MB/s. In every case I will found useful using this setup, it's a pity if we cannot use these NVME SSD on P4K! You're right, the Amazon page says it's a "Jmicro USB 3.1 Gen 2 to PCIe Gen3x2 Bridge Controller – JMS583". And yeah I'm getting around 900MB/s when it's plugged into a MacBook Pro 2018 – not too shabby! Got a 30GB file transferred in about 30 seconds. Thank you so much for passing that info on. I didn't realize the controllers were so new. I can't seem to find anything other than a JMS583 chipset – if you stumble across one, or if there's a link within the links you sent that I missed, please pass it on. I think I'm going to try and use a Akitio Node Lite with an AngelBird NVMe to PCIe converter. Perhaps this will solve any power issues. Will report back if anything works anyway. Another weird trying could be using a USB-C to USB 3.1 type A cable on the NVME enclosure, connected to a USB 3.1 Hub and then connect the hub to p4k with a USB 3.1 type A to USB-C cable. Only to see if it's a Gen2-Gen1 mismatch... this way passing through a 3.1 USB Hub, maybe it lowers the speed and make it compatible/visible on the USB-C Gen1 port of p4k. Of course not a solution, just to find out if it's the Gen2 connection that causes problems. I've ordered from China a different enclosure that seems not to be a Jmicron one (the most spread out for sure), but I don't know if it's the ASM chip (I suppose because I don't know others)...: I'll see when it'll arrive (model: Aluminum 10Gbps USB3.1 TO PCI-E NVME NGFF M.2 SSD M KEY HDD Enclosure with Type C to Type C Cable Heatsink Hole for PC Desktop [not the model with USB-C to USB-A that is JMicron]). But I still don't have the p4k, so... I'll had to wait a bit more. I tried using a USB-C to USB-A cable, the one that came with the Samsun T5. Tested through a USB-C dongle that I use for my MacBook (HooToo brand). Unfortunately while the T5 was recognized, the NVMe wasn't. It also recognized an SD card in the slot of the HooToo dongle too, which was interesting. So the T5 500GB works with 3:1?? That is good enough for me . Thing is, BRAW has been in development for a while, and I gotta believe if the results that UMP users are saying about the quality of BRAW and the much smaller file sizes, and the much faster workflow are true.. and it is coming to BMPCC4K.. then I gotta believe that BM knew that the majority of owners, once BRAW is available, will be recording using it and the USB 3.1 Gen1 speed was fast enough to handle even Q0 quality. Though I do think they should have used 3.1 Gen2.. maybe it was too expensive, too buggy, too incompatible with the majority of USB 3.0 (3.1gen1) SSD options, that they wanted to remain as compatible as possible with what is available. Is there some way to request certain drives/enclosures/SSDs to be tested by BM? I only see a few SSD options and would like to see if more will make the list (primarily USB-C options). I also read somewhere that a 95Mb/s UHS2 (3?) SDcard is capable of recording 4K60 12:1 BRAW... is that true? if so, that is amazing. I really hope there is some way for a firmware update to make it possible to either record to both USB-C and SD (in say an HD/proxy) at the same time, or to be able to transfer video from the "faster" card (in my case USB-C) to the slower one (SDHC) to have in camera backups of video. It would be really great if I could plop in easy to find/use SD cards and copy the video from my T5 to the SD in camera so I can keep my T5 plugged in and just deal with SD cards. OR.. if possible, a 2-way USB-C option..e.g. where one plugs in to my T5, and the other I can plug in to my computer to copy the files from the T5 while it is attached/plugged in to camera, to my computer. Justin, regarding SSDs, the Wise Portable SSDs for the BMPCC4K did not ship in time to be evaluated by BMD as they were only released in November. Wise-Advanced has assured me they do work with highest recording mode being 4K60p raw 3:1 due to the limitations of SATA. Wise performs their product testing on their own BMPCC4K. The drives are available from CVP for the EU and Core Micro Systems in the US. A Canadian distributor has not been finalized yet. Are we stucked at 15 november? I'm getting my BMPCC 4k this week. I have a Crucial Mx300 SSD, i'd like to understand how far i can get in terms of recording quality. CF cards are really out of reach, too expensive, i have to find an affordable ssd. From what i get, with the new raw format coming out we will forget our headaches, right? The Crucial MX SSD seem to be "by far" the most power hungry drives, so externally powered enclosure would be beneficial if not required. My USB 3.1 gen 2 Sata controller collection is growing... while waiting for the BMPCC 4K. Now I got JMicron JMS580 as a "bonus" when I ordered cheap full aluminium case+sled(USB C-->C) from China to use with the CFast to 5 pin SATA + USB A to 7 pin sata. Shall be somewhat interesting to see what records the longest (in seconds) with the limitations the camera seemingly has. The USB C port controller +(ASmedia ASM1351 VS ASM1352R(raid 0) VS JMicron JMS580) VS what ever CFast (SATA) controller the BMPCC4K has. Missing is the ASM235CM that only seems to be used in the portable USB 3.1 gen 2 SSDs. I still havent found any good answer to how much we can record in the different BRAW formats on given sizes. E.g. I have a 500GB T5, how much 4K DCI, UHD and HD can I record using BRAW Q0, Q5 and the various other compression options? Does anyone know if the new samsung 860 pro series work for bmpc 4k? (I know everyone is talking about bmpcc 4k now when I just bought a used bmpc 4k...) Many thanks. Ok I have tested the USB 3.1 gen 2 enclosures and cfast to SATA, at 4096x2160 raw lossless 60 FPS extended lut. Best enclosure was the one with ASM1352R controller, but funnily enough in spanned mode, raid 0 an 1 failed at 13 seconds while spanned wen’t to 16. The enclosure with ASM1351 controller seemed to vary 13-11 seconds. The enclorure with Jmicron controller didn’t work at all with the BMPCCK4K. Now by far the best way is to plug that SSD in to the cfast slot.... the recording is still going at 13min... 45 min left on the 2TB Samsung 860 EVO. The camera battery will run out before the recording ends at this rate. I'm using external USB PD power bank to power the SSD. Had first hard crash with camera while testing... with cfast(SSD) just formatted an sd card in the other slot pressed record (default was to record to sd) and the Camera froze. I had to remove batter to unpower the camera. The asmedia controller enclosures seemed to be detect OK when the camera was already powered. Couldn’t get the enclosure with Jmicron controller detected at all, it powered on but no format option appeared, works on game console so at least it’s not completely broken. Last edited by Cooper on Tue Jan 15, 2019 10:54 am, edited 3 times in total. 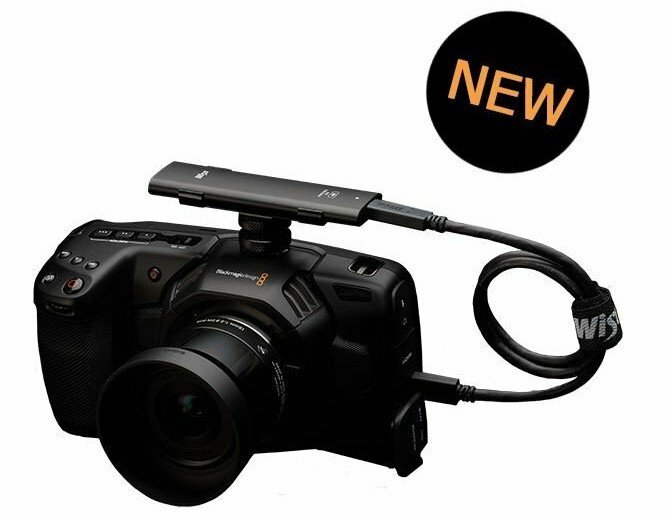 Jay Wong wrote: Does anyone know if the new samsung 860 pro series work for bmpc 4k? (I know everyone is talking about bmpcc 4k now when I just bought a used bmpc 4k...) Many thanks. I just tried a Samsung 840 Evo 1TD SSD and the Pocket 4k did not see it. I used a USB-C closure and the same USB-C to USB-C cable I use for my Samsung T5. I'm not sure if the Pro Series would differ that much. Hope this helps! I would say it's not the SSD itself (Evo vs Pro), but the chip in the enclosure (USB-C to Sata) that can make the difference. How does your Sandisk Extreme portable 1Tb work? Does it have the same issues with loosing connection as Sansung SSDs have? I'm thinking of ordering one. So I got a Samsung Portable SSD T5 for the purpose of recording footage for the Pocket Cinema 4k. I'm able to format the drive, but it always says "FULL" and there's nothing on it. I can't record and formatting it on my laptop to clear space doesn't seem to help. Is there something I'm missing? As far as i am aware sandisk extreme SSD and samsung t5 use the same asmedia 3.1 gen 2 chipset ( the only USB 3.1 gen 2 to SATA 6G chipset that i have not tested), and that will be the limiting factor. Then again with the limitations the USB-C port chipset (5G) on the bmcc4k has, the ssd disk should not matter that much on any of the usable recording formats, excluding the 60fps 4096 CDNG RAW. Now if your connecting normal SATA SSD on the CFAST slot then the size will matter if you wan't to record the mentioned highest data rate... 2tb and up at least on the newest Samsung SATA SSD drives for the much needed 550MB/s. Last edited by Cooper on Wed Jan 30, 2019 9:23 pm, edited 1 time in total. Samsung T5 SSD not always recognised. Does anyone have a solution to the T5 Samsung USB-C being only occasionally recognized? There's no real reason - it's either there or it isn't, the camera sits on bench and nothing else has moved. Not that keen to take it out on a shoot just yet, is there an update for this. Anyone else have the same issues? Keen to find out if it is a known issue - where is that update? I can confirm this too. I've been pleased with it otherwise and it hasn't occurred as often as you but it has happened enough that I feel it needs to be addressed by BM. Seems to require a reboot. I have only had this problem from time to time. Usually after I am done recording and copying off to my machine, I reformat the SSD. Seems to work pretty good most of the time. Still havent quite figure out how to duplicate the issue.